It is long gone the time when people would be ashamed of being a blogger. With so many successful cases that could be named in the world (all making more money than a large percentage of white-collar professionals), writing for a blog became a very respectful way of living. But you might be one of those that don’t want to be a professional blogger. Instead, you want to use it as a way to get that promotion in your current job – which you would leave for any self-employed status. So here is how you can get that career promotion. Writing about what you know best will make you sound like an expert. You will give your opinion about what is going on, let people know the trends and publish the latest news from your sector. This is something only the most experienced can do, which can help you become part of that team you desire. Just make sure that you do it in a professional manner, so that you don’t promise what you can’t deliver, and that you only write about what you know best, to avoid looking foolish. And yet, as you probably already know, you don’t need to have a degree in the subject to write about it. You just need to know a bit more than the majority, and you will be fine. If you want to get serious about blogging, you should consider doing some interviews. It brings authority and credibility to any text, as it’s not only your opinion but a real story being told. Interviews also can be a great opportunity to meet new people who might become great leads, partners or clients of your company. Rest assured that the board of directors will be very pleased when they find out, and will start considering you as a good option for higher positions. You will have to do a lot of research so you can write your posts. You will need to read a lot, watch videos, and so on, meaning that you will be learning new things every day. 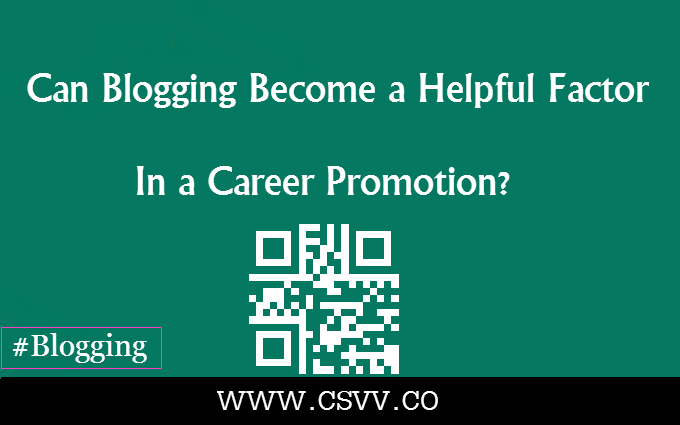 That is to say that blogging will keep you updated, and aware of the latest news of your sector, and with plenty of new ideas to share during your work meetings – one of the best ways to boost your career, for sure. Blogging can be your secret weapon on your quest for that dreamed career promotion. It will help you to show off (and improve) your skills and expertise without you having to brag about it in the office. You will also be more likely to meet influencers and other people who might become relevant to your company. The only thing you need to be careful about here is not to mention anything that is confidential about your company, or that will hurt a colleague’s privacy. Having said that, as you can see, putting it all together will make you sound like a highly skilled professional and can increase your chances of a career promotion. So start blogging right now – and don’t forget to share your posts with your colleagues so the word will be spread in your company. Benedict Brychta is an MBA student from San Jose, CA. He is a big movie classics fan and he loves to share his opinion on different things happening in the spheres of film industry, self-improvement and lifestyle.